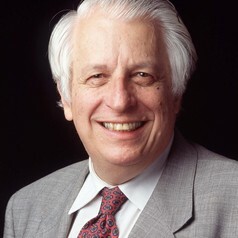 GUSTAV NOSSAL was born in Austria in 1931, and came to Australia in 1939. In 1965 he was appointed Director of The Walter and Eliza Hall Institute of Medical Research, a position he held from 1965-1996. Sir Gustav is currently Professor Emeritus within the Department of Pathology, The University of Melbourne; a consultant for the World Health Organization and the Bill and Melinda Gates Foundation; and a Principal of Foursight Associates Pty Ltd. He was formerly Chairman of The Global Foundation Advisory Committee and Deputy Chairman of the Council for Aboriginal Reconciliation (1998 to 2000). He is a fellow of the Australian Academy of Science. He was knighted in 1977, made a Companion of the Order of Australia in 1989 and appointed Australian of the Year 2000.